In any social community, there are leaders, followers, and “hangers on.” Whether Formal or informal, any community has surface and sub-surface dynamic. There’s a spoken and unspoken synergy, a subtle social exchange. In the workplace, Customer Success leaders seem to excel at influence and inspiration. (A leader doesn’t necessarily need to be a manager. A leader can embody any job role). Colleagues seem to defer to them and follow their lead. Even the less engaged concede a central role to the leader. So, potential leaders may need these five hints on why and how to influence and inspire colleagues. Why bother to take charge. Dr. Lickerman goes on to argue that influence does not require your conscious intent. Now, it may be true that you have some influence on others regardless of whether your behavior is good or bad. But, the intent here is to show how you can learn to influence others directly and deliberately. If you don’t do it, you leave that leverage to someone else. There’s not a lot of value in leading by accident. That is, players may gravitate towards the pitcher with the best curve ball, but that skill does not qualify him to make strategic decisions. The sales leader may persuade the most customers but still remains disliked by her colleagues for a dozen reasons. Expose yourself. If you want to lead from above, you have to position yourself. It takes courage to lean in, step up, and speak up. If you share the problem and the need for solution, you position others to see and accept your solution. Approaches like this let you speak out without jeopardizing your career. Share your confidence. With confidence in your goals, ways, and means, you can speak with authority. Acting with confidence influences others to trust you. It’s very hard to lead and influence from a position of insecurity that will be perceived as weakness. You can work on posture and voice. You can strengthen your handshake and improve your smile. You can work on body language to reveal your self-confidence and self-possession. Try to avoid ending remarks with a tone of voice that suggests everything you say is a question. Eliminate certain conditional words from your vocabulary: would, could, might, try, want, need. Replace them with active commitments: will, do, must, complete, finish. Because these are behaviors, they get noticed above and below. 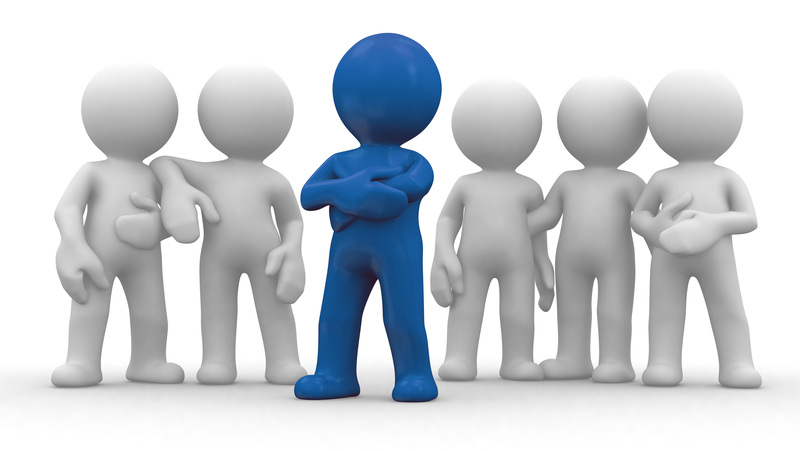 Even if you have not been in a position of authority, your bosses will notice and respond to the show of confidence. Earn and return trust. Influencing colleagues requires you to lead horizontally. Colleagues are, by definition, at your level in the organization. Once you have a grasp of your own strengths and emotional intelligence, you have to assess the temperament, personalities, and values of those around you. Any social relationship, like the workplace or work teams, has a reciprocal connection among members. Colleagues are those who have been grouped by interests, goals, or tasks. So, the members first assess the readiness and rightness of the other members. Trust begins when they see that in you. But, it’s your consistency and reliability that strengthen that trust. And, perhaps ironically, you build trust in yourself as you express trust and confidence in the work of others. 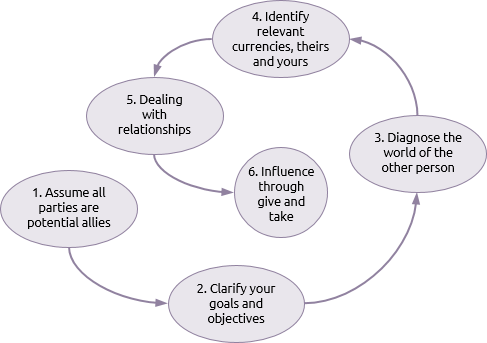 Determine how the need to influence others aligns with your goals and objectives. Use empathy to understand and appreciate your colleague’s values and culture. Diagnose what drives others: inspiration, task, position, relationship, and/or personal values. Adapt to relationships with the various needs of others. Work towards give and take where both parties find something satisfying in an exchange. Recruit others. To win, you need others to work with you. You need to leverage their relationships into cooperation and work. Asserting your need, the task’s needs, and the colleague’s singular skillset will proactively select and staff your purpose with like-minded and supportive colleagues. Influence leads. It attracts and drives. And, it begins with your ability to appear confident and optimistic, knowledgeable and energetic, and skilled and willing. It strengthens through effective and reciprocal trust and values. With no apparent personal agenda, you can leverage the will and talents of colleagues for the best outcomes. In developing your personal presence and power, you attract and motivate others. These five hints on how to influence colleagues restore confidence in the earlier thinking of Dr. Lickerman that control over others is basically a function of control over yourself. TIP: Master the influence over your own behavior, and influencing others will become second nature. What tactics do YOU use to influence and inspire colleagues? Feel free to share ideas that worked for you in this matter.